Sarsaparilla Dilution is a homeopathic medicine for digestion and urinary tract disorders.With the urinary problems, there is severe pain at conclusion of urination. Children may scream before and while passing urine. This homeopathic remedy is made from a plant commonly called wild licorice. 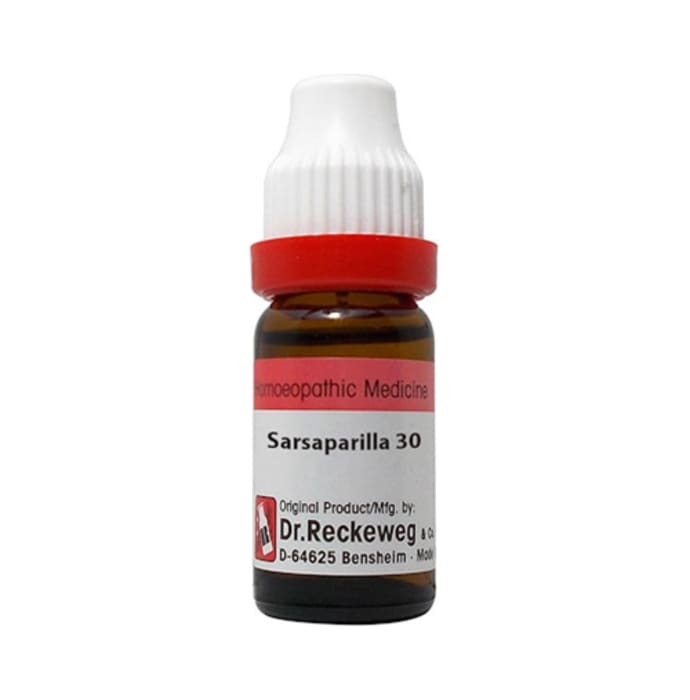 Active Ingredient in the dilution is Sarsaparilla Homeopathy is a form of medicine that has been practiced for nearly two hundred years all over the world. A great amount of research and documented clinical cases have shown that Homeopathy is exceptionally safe, effective and useful for most everyone. It is a naturopathic form of medicine, meaning it works with the body s own systems and energies; its natural way of operating and functioning. It does not override or divert the body, instead it assists the body s own healing energies to triumph over dis-ease and illness. Flatulence, Dry skin, Itching. For urinary problems, colic with backache as well flatulence and dry itch skin. A licensed pharmacy from your nearest location will deliver Dr. Reckeweg Sarsaparilla Officinalis Dilution 30 CH. Once the pharmacy accepts your order, the details of the pharmacy will be shared with you. Acceptance of your order is based on the validity of your prescription and the availability of this medicine.